Significant strides have been in the race to find antibiotics to treat superbug infections — those caused by bacteria resistant to the antibiotics used to treat them. Now, an international team of scientists has discovered a new antibiotic produced by a microbe found in Italian soil. The new research, led by Richard H. Ebright, at the Waksman Institute of Microbiology at Rutgers-New Brunswick, led the research published June 12 in the journal Cell. The new antibiotic killed drug-sensitive and drug-resistant bacteria in lab experiments and cured bacterial infections in mice. "The discovery also underscores the importance of natural products in providing new antibiotics. Microbes have had had billions of years to develop 'chemical weapons' to kill other microbes," Ebright said in a press release from Rutgers University. More and more bacteria are developing resistance to the drugs we usually use to treat them. It's happened for a variety of reasons, including overuse and misuse (like using antibiotics to treat viruses). Resistance develops when bacteria mutate to avoid the drug's adverse impact on their survival and reproduction. When the drugs no longer work, infections we used to be able to treat become life-threatening. About two million Americans a year develop antibiotic-resistant infections, and at least 23,000 of those people die. In February 2017, the World Health Organisation published their list of bacteria for which we desperately need new antibiotics to treat. The most critical group includes bacteria that are resistant to multiple drugs. They pose a serious threat to patients in hospitals, nursing homes, and facilities where patients use devices such as ventilators and blood catheters because the bacteria can be passed from patient to patient through those devices if they're not cleaned well enough to disrupt the biofilms that form inside the machinery. Bacteria in this critical group are Acinetobacter, Pseudomonas, and Enterobacteriaceae, such as Klebsiella, E. coli, Serratia, and Proteus. These organisms can cause severe and often deadly pneumonia and blood infections. Time is running out to find antibiotics for these and other multi-drug resistant organisms. A 2014 report estimated that by 2050, 10 million people a year will die from antimicrobial-resistant infection. That's the very definition of an urgent threat, and exactly the problem Ebright and his team tackled. One bacterial target for antibiotics is an essential enzyme in the microbes, RNA polymerase. It's a good target for bacteria-killing drugs to hit because it's present in many bacteria, and the bacteria need it to produce essential proteins. Other antibiotics, like rifampin — a drug used to treat tuberculosis — act on this target as well, but bacteria have developed a resistance to that drug. 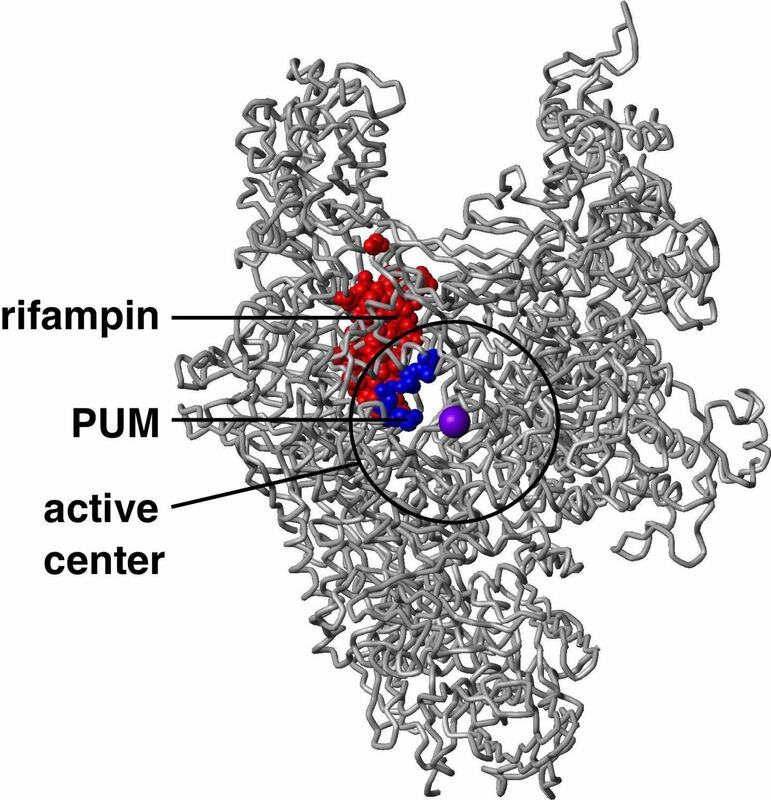 A new antibiotic discovered by the research team has several distinct advantages over rifampin and how it acts to kill bacteria. The scientists found pseudouridimycin, the new antibiotic, by screening soil samples collected in Italy. Like rifampin, it inhibits bacterial RNA polymerase, but it binds to a different place on the enzyme and inhibits its actions through a different mechanism than rifampicin uses. Pseudouridimycin (PUM in the image above) uses a different binding site on the RNA polymerase enzyme than rifampin, which means doctors can use them in combination. In tests, the researchers found that the bacteria becomes resistant to the new drug at one-tenth the rate it grows resistant to rifampin. Bacteria are less likely to develop resistance to pseudouridimycin because it's binding spot on RNA polymerase can't be changed without losing its function. And without a working RNA polymerase enzyme, the bacteria cannot survive. Pseudouridimycin's binding site on bacterial RNA polymerase is almost identical to a site on human RNA polymerase, so scientists wondered if the new drug might inhibit the human enzyme, as well. It doesn't seem like that's an issue, though, since a portion of the pseudouridimycin molecule binds to a region in bacterial RNA polymerase that is not present in the human version, meaning it'll only work on bacteria. The new antibiotic was a potent inhibitor of bacterial RNA polymerase in the lab, inhibited the growth of E. coli and streptococcus bacteria in test tubes, and cleared a Streptococcus pyogenes infection in mice. Our discovery of this class of antibiotic from conventional microbial extract screening indicates that, contrary to widespread belief, conventional microbial extract screening has not been exhausted as a source of antibacterial lead compounds. That note of optimism and the discovery of pseudouridimycin give us hope that we can still find antibiotics to treat multi-drug resistant organisms — new drugs that will make it tougher for bacterial resistance to develop.